Capable of supporting Spurs, Sunflowers, Owen Wister, & Electric Light. A MasterWork of rustic Tablery. A WonderWork of Weathered Wood, Elaborate Knots, & beautiful boltware. 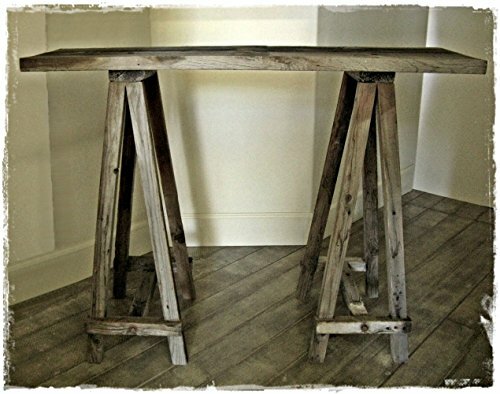 Tables are inspired by the milieu of the Western United States: They Savor of the Cowboy the Tack Shed, A Sawhorse, & Saddle-trees. Designed for hospitable living in any Ranchhouse--- whether it be in the Bronx, Newark, or Knoxville. Minimal assembly required.